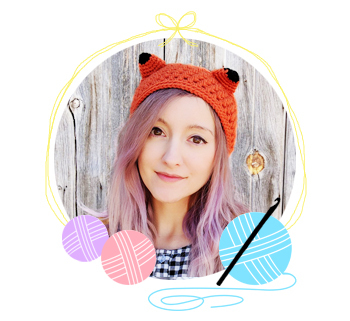 Hey guys, I've got a new free crochet pattern for you today! 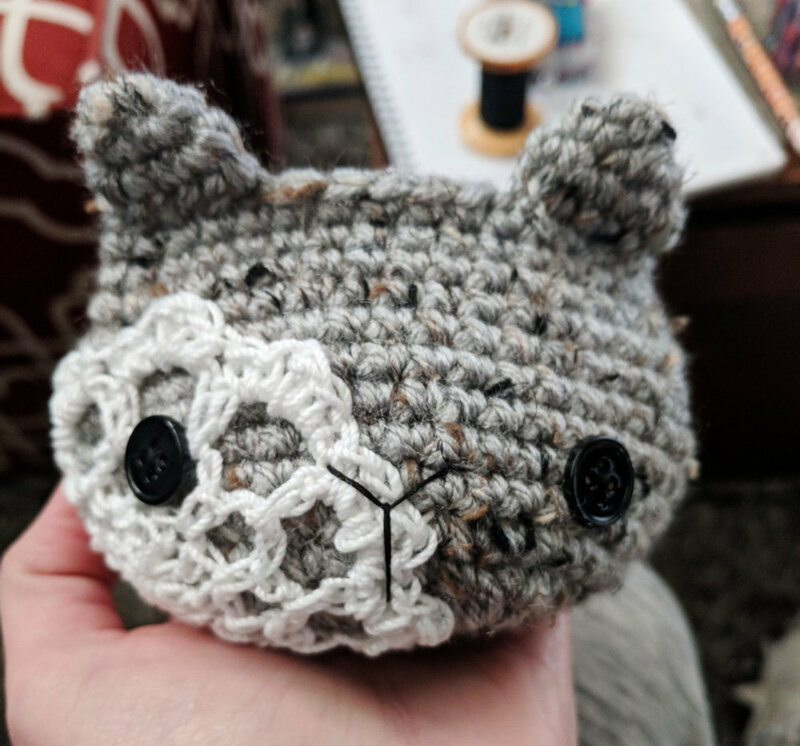 It's a cute little kitty coin purse. 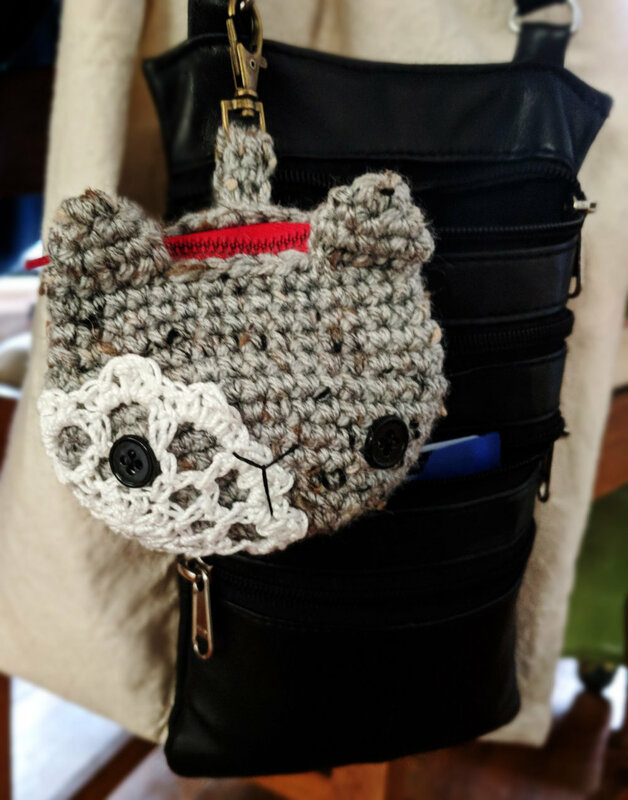 I made this for myself, so I didn't take very many in-progress photos, but I DID take detailed enough notes that I could share it! So apologies for that, but you'll have to figure it out without photos. I also am not including instructions on how to sew on the doily, or how to sew on the zipper etc. I didn't take any photos of it and it's pretty useless trying to explain with words. For the zipper, you can search for youtube tutorials if you need them. I made this guy cuz I carry a really small purse, and it was getting hard to keep coins and keys in there! I work a bar shift once a week, so I always have cash, and I live downtown, so I like to be able to zip my purse shut, and it was a struggle with my keys and coins and phone. Thus the need for a coin & key purse! 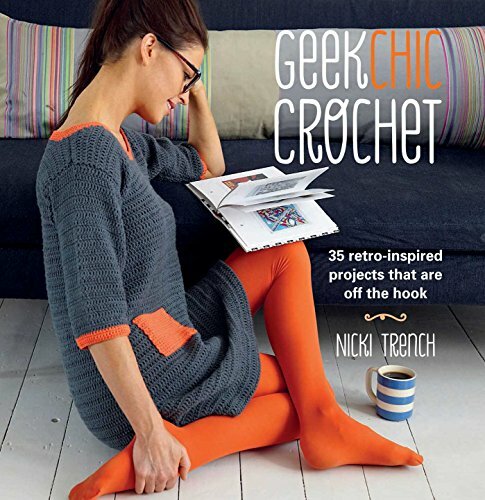 And of course, I crochet, so I wasn't about to buy one! As if! ...Actually I have a really cute one that I DID buy a few years ago, but it doesn't have a key ring attachment, so I would have had to put one on the zipper, which might make the zipper break eventually. So. The doily is optional, and you can try using whatever you have on hand. Also you might not need the lobster clip, but it's an essential part of my coin purse! So let's get started! Grab your 4mm hook and make a magic ring of 6sc. Pull tight and sl st to first sc. Join rows as you go. Finish off, use tails to sew onto head. Grab your 3.5mm hook and make a magic ring of 9dc. Pull tight and sl st to first dc. R1: Ch 4, then sc into the first st. *Ch 3 and sc into the next st* repeat 7 times. Finish with sl st.
R2: Ch 5, then sc into the ch sp. *Ch 4 and sc into the ch sp* repeat 7 times. Finish with sl st.
R3: Work this into each ch sp: 2sc, dc, 2sc. Finish with a sl st. Finish off. I recommend sewing on with a needle & thread, rather than using the end tail. Use pins to hold in place while you sew it on if you need to. ...you should have something like this! Now you should sew on the zipper. Next, make a strip for your clip. Fold the strip over, then sew it to the back of the purse with your tails. I'm actually going to redo mine and make it shorter, and use the smaller 3.5mm hook. 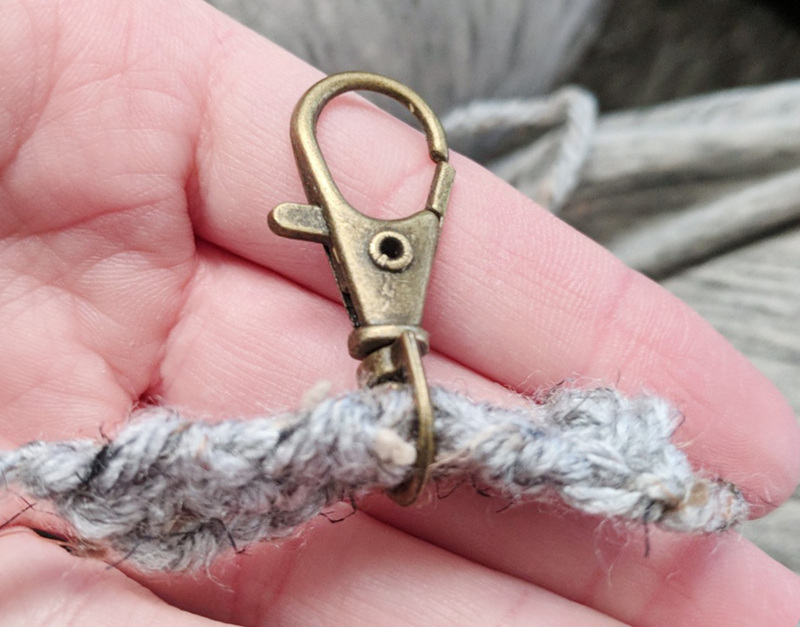 See how much stretch that crocheted clip loop gets? Yeah, needs less stretch. So that's that! 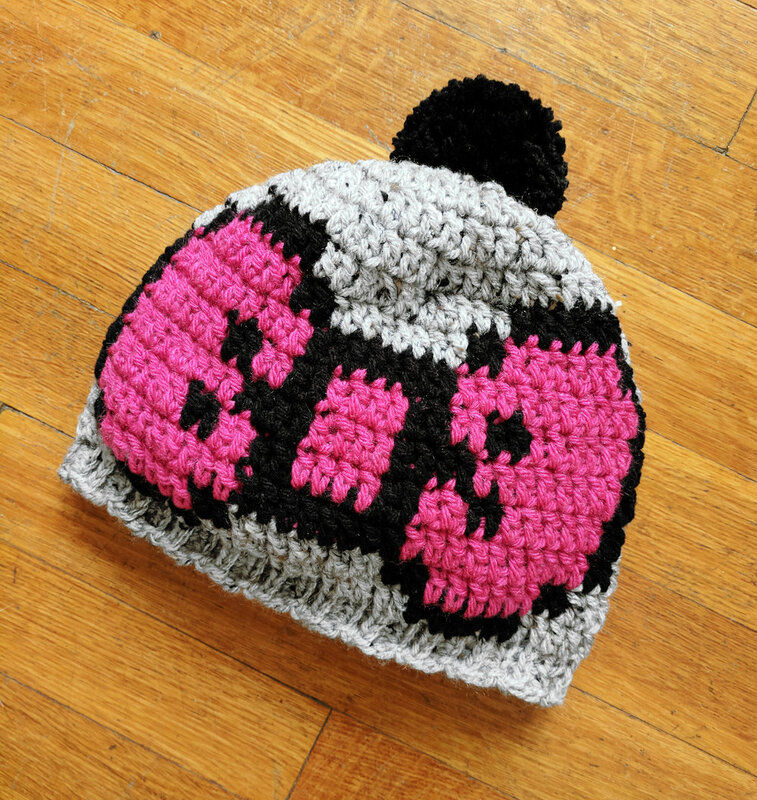 Sorry it's kind of a lame pattern without pictures, but hey, it's free. :D Tag me on social media if you make one! !